When the tour guide uses the words "wars of independence" you know you're in a country with a complicated and tragic history. Hungary is in the fertile Carpathian Basin that's been coveted for over a thousand years and successively claimed by Celts, Magyars, Romans, Mongols, Turks, French, Italians, Germans and Russians, some of them several times each, and if I think too hard about all the history I heard today the whole lot evaporates out of my head. Back at Heroes' Square, the four big statues on top of the colonnades represent Labour ("we know all about that"), War ("we've had so many wars"), Peace ("we've had hardly any of that in our history") and Progress ("still waiting") - that's according to Agnes, and she knew what she was talking about. Later we went to the Terror Museum, in the Budapest equivalent of the Champs Elysees with Gucci and Louis Vuitton just down the road, and tiptoed through the building used first by the Hungarian Nazis (who knew?) and then by the military police, who were the same people in a different uniform. It was stern stuff, well presented and thorough, and though there could have been a bit more English labelling, there was no doubt about what went on there - and on, and on. The voice testimonies were pretty riveting, godawful stories from ordinary-looking people; and then there were the torture instruments, including an actual battered bright light on a stand by a chair in the 'Treatment Room' that made a joke I've often made seem very sick. And there was a gallows (used). It was horrible, and sad, and confusing: just a couple of days ago, in Zagan, we were feeling sorry for the Russians in the concentration camp of Stalag VIII C, and now here they were doing unspeakable things to the Hungarians. Bad people are bad people wherever they were born, I guess. 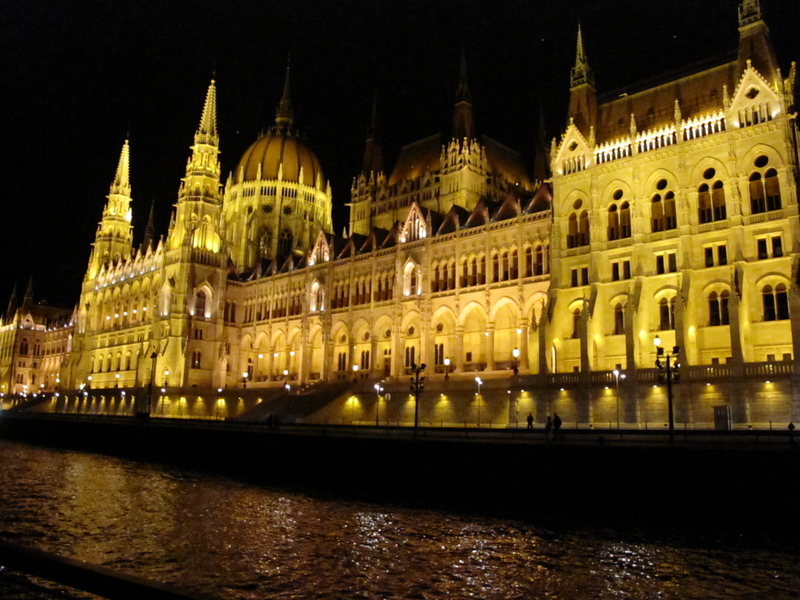 But there were beautiful things today too: the interior of the fabulous Parliament buildings, the lovely church up on the hill in Buda, and a spectacular dinner cruise along the Danube with all the bridges and best buildings perfectly lit up and colouring the black water.